Not too long ago, I came out of Mass with 1 John 4:16 on my mind and heart: specifically, ". . . he who abides in love, abides in God and God in him." What came through my mind was that the first part, abiding in God, being enveloped by him, is more often sweet, permeated with peace, and seems to happen more readily. God abiding in us brings the thought of being wounded, but in a welcoming way – not humanly so or something readily done, but more than worthwhile when recognized and embraced. It is more of a "journey" than the first dynamic. More than words can say, it is like a picture in my mind's eye, the end all and be all of being at home with God, and how it comes about and is experienced. What struck me simultaneously was that since the first dynamic brings less challenge, so to speak, then one can turn to God fully as frequently as possible. This will help increase the welcoming that happens – God abiding in us. It is somewhat like the Little Flower's religious name: St. Therese of the Child Jesus and the Holy Face. 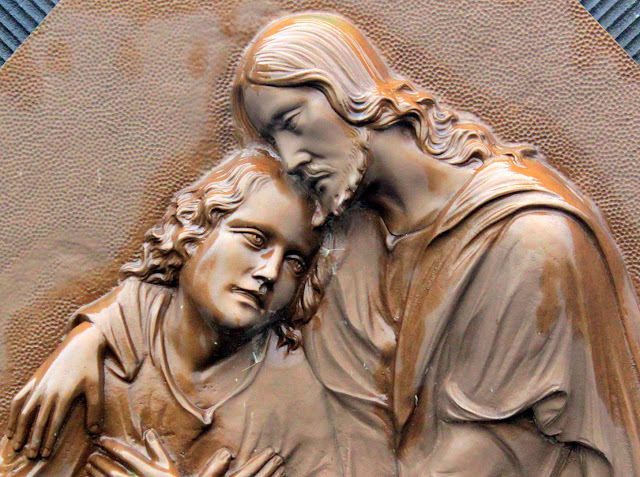 It conjures up an image of jumping into God's lap just like a child and, in so doing, opening the way for intimacy with Jesus and the fullness of who he is – his suffering Face driving home the depth of love. It is like our efforts to abide in God "sets the stage" or prepares us for him to abide in us, and yet it happens at the same time. He abides in us to deepen our desire to abide in him. Neither drops off – abiding in God, and he in us. They both remain, abiding to bring more life, both integral to love.